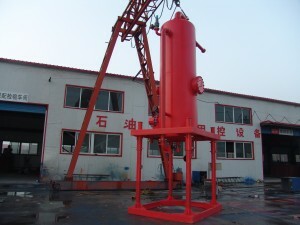 Mud gas separator sizing and design selection is important for petroleum well drilling.Welcome to consult GN for the right sizing and fit design for your mud gas separator in oilfield drilling mud. should know mud/gas separator technology and recommends separator configuration, components, design considerations, and a sizing procedure. A simple method of evaluating mud/gas separation within the separator vessel has been developed as a basis for the sizing procedure. A mud/gas separator sizing worksheet will assist drilling personnel with the sizing calculations. The worksheet provides a quick and easy evaluation of most mud/gas separators for a specific well application. A brief discussion of other mud/gas separator considerations is provided, including separator components, testing, materials, and oil-based-mud considerations. The mud/gas separator is designed to provide effective separation of the mud and gas circulated from the well by venting the gas and returning the mud to the mud pits. Small amounts of entrained gas can then be handled by a vacuum-type degasser located in the mud pits. The mud/gas separator controls gas cutting during kick situations, during drilling with significant drilled gas in the mud returns, or when trip gas is circulated up. Questions for mud gas separator sizing and design. 1,We enclosed our normal models mud gas separator quotation of FOB,Shanghai,China and our latest products Brochure FYI.As the increasing of freight and raw material,the price of mud gas separator increased. 2,For selecting the right sizing and design of mud gas separator,please tell us the treating capacity,and other special requirements? 3,The mud gas separator need to match with flare ignitors,we manufacture flare ignitors(Torch unit),do you need it? 4,Please review our solids control brochure,and give us your inquiry. 5,About lead time for the mud gas separator,we have some of the equipments in stock,after we know the sizing and design you need,we will tell you. Kindly provide us your Mud Degasser sizing calculations. Please let us have your sizing calculation sheet for mud gas separator. I would like to have a copy of the calculation sheet as I am trying to design an air drilling (close loop system) project. I would like to have a copy of the calculation sheet as I am trying to assess the capability and suitability of a mud gas separator for our operations. 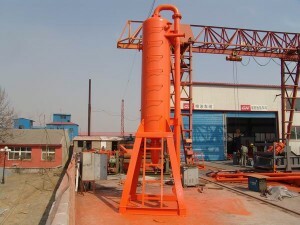 Can you please provide us the sizing calculation sheet for the mud gas separator? just i want how will be the hight of the top of the poor boy to help me to design it because i have apoor boy with out skid , so how can i desighn it ? I am in fact thankful to the holder of this website who has shared this wonderful piece of writing at here.